World Heart Day was celebrated on 29 September this year, ‘Heart Healthy Environments’, focused on encouraging children to be more aware of their opportunities around them in order to lead a healthier life. Taking part in more Physical Activity a week and eating healthily is obviously a priority. The day started with students being actively involved in their Enrichment sessions and Year 9s were woken up with a ‘wake up shake up’ session led by Mrs Stewart. At lunch time, Al Kindi Hospital were on hand, offering advice on nutrition, measuring students’ Body Mass Index (BMI), Blood Pressure and Blood Sugar. They also had informative literature to advise children on how to lead a healthier lifestyle. Al Kindi wanted to get across the message that children should be more active and spend no more than 2 hours a day on all forms of technology – television, internet, computer games, and mobile phones to name a few. Many thanks to Dr Mohammed and his team for their participation. 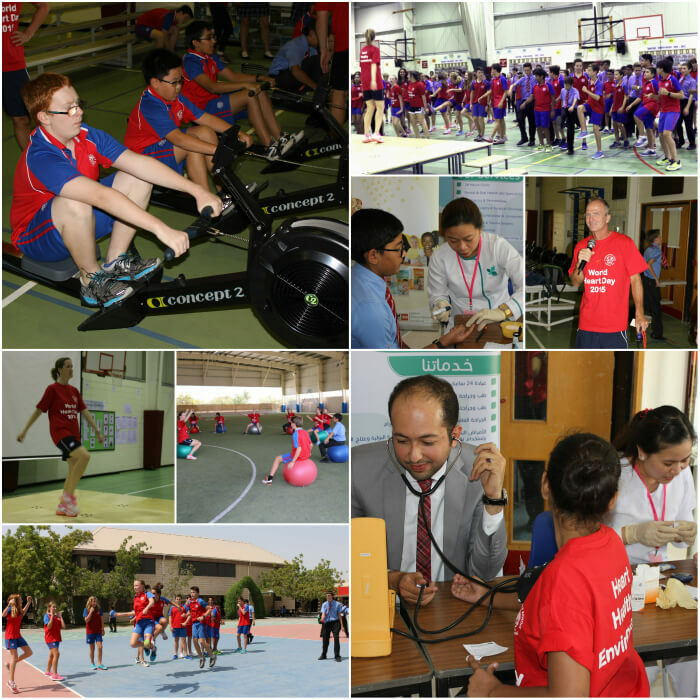 Over 40 students and staff took part in the Multi Stage Fitness Test (MSFT) to test their cardiovascular fitness; and another 100 students and staff took part demonstrating their skills in the Rowing Challenge and in Double-Dutch skipping out in the playground. New this year was a ‘Javpel’ session led by Mrs Stewart out on the Tiger Turf – an aerobic activity using exercise balls. Huge congratulations to everyone who took part. There was a great buzz in the Sports Hall and the playground and the PE Department would like to thank everyone for taking part in a very successful World Heart Day.